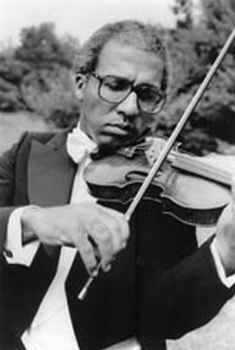 Violinist Sanford Allen was born in New York in 1939. His musical career began at the age of five with piano study. In 1946 he entered the preparatory program at Julliard to study violin. Allen continued his violin studies at the Mannes College (The New School for Music, in New York) under the tutelage of Vera Fonaroff who had also been his teacher at Julliard. While there he also attended the New York High School of Music and Art. Allen was also a student at the Berkshire Music Center (Massachusetts) in 1956. In 1962, he became the first black musician to become a regular member of the New York Philharmonic Orchestra and remained a member until his resignation in 1977. Allen’s career since 1977 as a solo performer and freelancer led to a varied musical trajectory. He has served on the School of Music faculty of Rutgers University (New Brunswick); Director of the Clarion Concerts Leaf Peepers series and advisor at the High School of Performing Art (New York). He has also been an advisor to the New York State Arts Council and served on the Executive Board of the Kennedy Center National Black Music Colloquium and Competition. Allen’s solo appearances with orchestras have included the Detroit Symphony, the Miami Philharmonic, the Baltimore Symphony, the Quebec Symphony, and the Symphony of the New World among many others. Allen has been the recipient of numerous awards including the Federation of Music Clubs (1956) and the Koussevitzky International Recording Award (1974). While most of his work has been in classical music, Allen has performed frequently for musical scores in popular films. His résumé in this area includes violin performances in such films as Spike Lee’s Jungle Fever (1991), Alex Haley’s Malcolm X (1992), Spike Lee’s Get on the Bus (1996), and Harvey Pekar’s American Splendor (2003). He has also been a juror for the acclaimed Sphinx Competition for eight years out of the last 14 years. In 1969, Sanford Allen married Mahdur Jaffrey, author of numerous cookbooks on international cuisine. Dominique-René De Lerma, www.CasaMusicadeLerma.com; http://www.leafpeeperconcerts.org/sanfordallen.htm; http://www.sphinxmusic.org/; http://sphinxmusic.org/bio-sanford-allen.html.